A New and very Accurate Map of South Britain, or England and Wales. 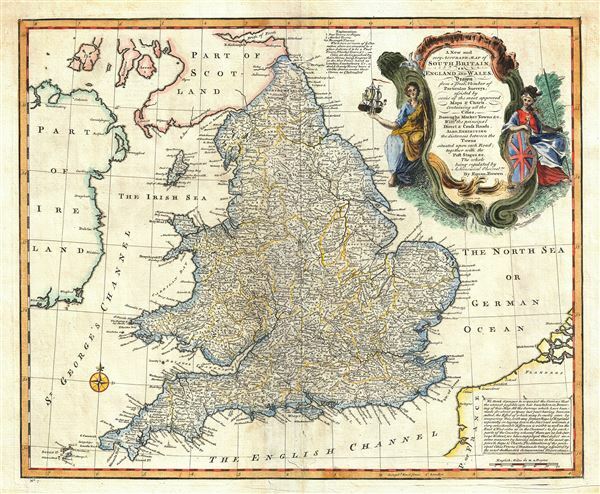 This is a beautiful 1747 map of South Britain, or England and Wales, drawn by the British cartographer Emanuel Bowen. It depicts the entirety of England and Wales, including the Isle of Man. The map is extremely detailed, noting cities, boroughs, marketplaces, counties, etc. Roads are noted with distances between towns. River systems are well delineated and forests and topography and rendered in profile. A note in the bottom right quadrant of the map explains the compilation of the map. A beautifully illustrated title cartouche is included in the upper right quadrant. This map was prepares by Emanuel Bowen as plate no. 7 for the 1747 issue of A Complete System of Geography. Very good. Minor wear and toning along original centerfold. Original platemark visible. Wormholes at two places near centerfold top and bottom. Rumsey 3733.006. Philips (atlases) 614 (1752 edition).